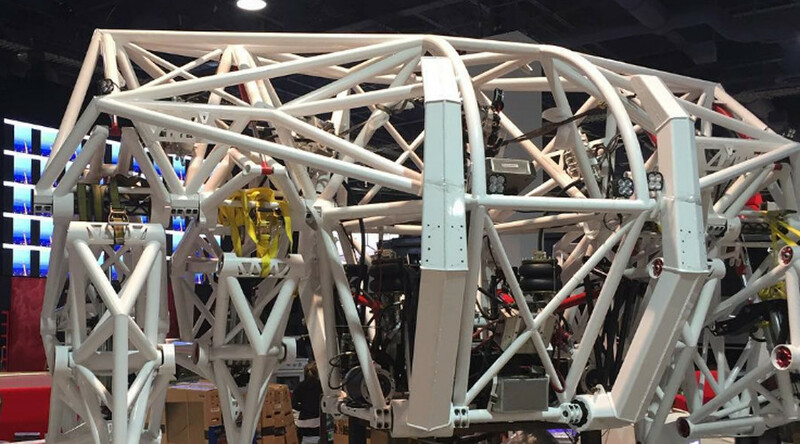 An imposing 14ft tall exo-bionic robot that can carry a human pilot to race robotic competitors at speeds of up to 30kph (19mph) has been unveiled at the major tech conference CES. The intimidating 16ft wide device called ‘Prosthesis’ was showcased by its Canada-based makers Furrion at the 2017 Consumers Electronics Show (CES) in Las Vegas, Thursday, before making a test run in the Nevada desert. “Imagine a stadium with obstacles, challenges and head to head competition, not with cars or trucks, but with giant, human piloted mechs,” the Prosthesis site states. The company describes the bot, which weighs a whopping 3,500kg (over 7,700lb), as a sports machine and says a trained athlete is required to operate it. The racer is powered by a lithium ion battery and will be capable of tackling any terrain at top speed for between 30 minutes and an hour, depending on its speed, according to the company. In spite of its alarming, human-enclosing appearance, manufacturers have promised that the ‘Anti-Robot’ is in fact very silent and you will hardly hear it as it speeds by.